Living Life One Day At A Time: Meet Ripley! Ripley is the newest member of our family! 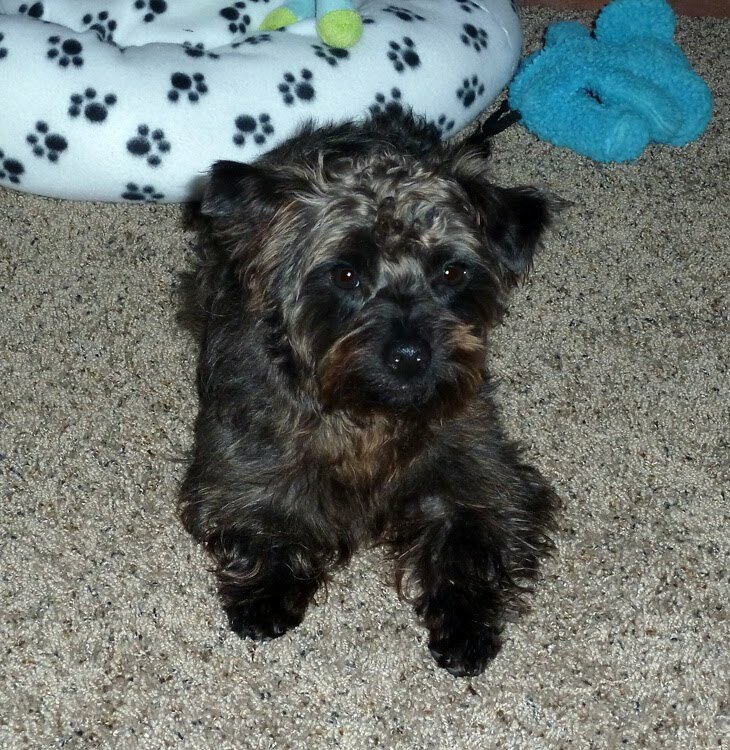 He is a 10 month yorkie/miniature schnauzer mix (the trainer thinks there's some cairn terrier in him too). He is an absolutely love! We rescued Ripley from Save a Yorkie Rescue. What a great experience! I spent months searching for the right dog for our family. I knew I like miniature schnauzers, and we even almost brought home Bella, a 4 year old miniature schnauzer who happened to gt adopted by someone else before we had a chance to meet her. 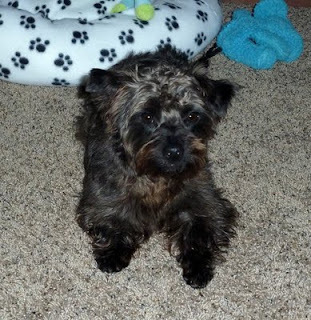 Disheartened, I focused my search on miniature schnauzers on petfinder.com. That's where I first saw Ripley. What a cutie patootie he is! I fell in love the minute I saw Ripley's photo. I put my application in the same night. I wanted to believe we would be chosen as his new family, but I knew there were many other interested families. We got through the phone interviews (with Lenore and Rhonda) and reference checks fine, and waited to have our home visit. When Beth arrived at our house with her two yorkies, we had a ball! Jake simply adored the dogs! When Beth left, we really started to get high hopes. Within minutes of her leaving, we found out we were approved. I cried. I was so happy, as I knew on my heart he was the best dog for our family. We drove 2 hours that night to bring our new baby home. Lenore and Don were Ripley's foster parents, and I have to say, Ripley could not have asked for better foster parents! It was very clear how much they loved Ripley from the way they talked about him and interacted with him. I am so very grateful to both of them for taking such wonderful care of my baby. Ripley has been an absolute joy! He is such a good puppy. He hasn't had any accidents in the house, and he hasn't chewed anything except for his toys, He is a cuddlebug, always wanting to be close to us.